How to motivate yourself again? Why do we lose motivation and how can we get it back? What do Motivational Speakers and Studies Recommend? Based on more than a dozen sources, we've put together 9 tips to motivate you. Wake up tomorrow and start a new morning in the right frame of mind, ready to change your life for the better. Lack of motivation can arise in every aspect of our lives, affecting work, our private life, interpersonal relations, planning, achieving goals and much more. The inability to move forward and to feel unable to follow through with our ambitions suggests feelings of indifference and dissatisfaction with our lives. Feeling unhappy, useless, joyless, we lose our sense of self and the desire to do anything. We forget who we are and what we are, losing our identity and autonomy. But is this beyond our control, or can we conquer these negative feelings? It is pretty obvious that we cannot feel full of sunshine 24 hours a day, every day. Each of us has doubts and feelings of despair, each one of us will know failure, and sometimes we feel lost in this crazy world. We just need to remember that this is not a permanent situation, but only a temporary state, and one that can be changed. So what do we do in those times when our motivation disappears? How do we fight back? What do we Mean by ‘Motivation’? Before we discover how to get motivated, we need to know what is really behind the concept of ‘motivation’. As with most psychological concepts, there are a lot of different definitions and interpretations of motivation. Early interpretations combined motivation as we know it today with factors like instinct, willpower or the character of a particular person. To take a more scientific approach, behavioural theories show motivation as being an increased or continuous response to incentives associated with rewards. Today, psychologists and sociologists assume that motivation is heavily influenced by individual thoughts, opinions, and emotions. The very word ‘motivation’ is derived from the Latin verb movere, which means to move around. In a simplified way, motivation can be described as a set of factors that keep us in constant movement, moving us to work and to fulfil our tasks and goals. WebFinanceInc.com is an educational website which defines motivation as a set of internal and external factors that stimulate the desire and energy of an individual to fully devote themselves to their work, hobbies, tasks or goals. It is about creating the power and stimulus to achieve your goal. 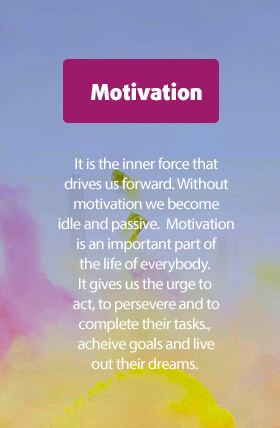 Motivation is the result of the interaction between conscious and unconscious factors, such as the intensity of desire or need, as well as the incentives such as a reward or sense of achievement for reaching a goal. Even though we have our dreams, plans and goals in mind, it can be difficult to stay motivated, especially when we encounter obstacles in our path. 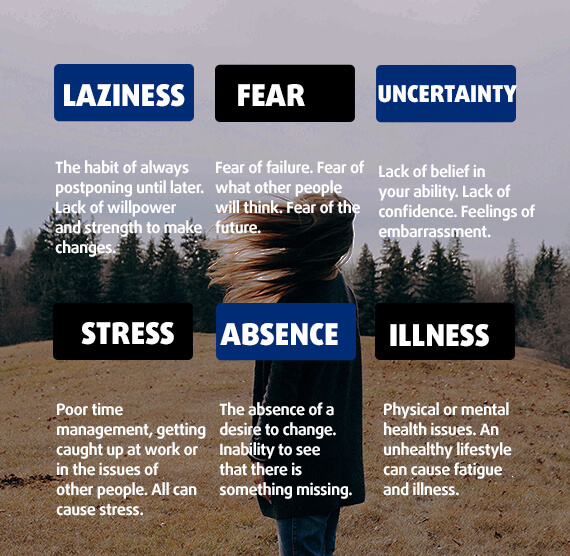 We can become demotivated for a number of different reasons, and this can put a halt to our plans to make positive changes. Remez Sasson, the founder of the Success Consciousness motivational site, explains the reasons for lost motivation. The above reasons, according to Sesson, lead to decreases in motivation and enthusiasm, and they allow people to make excuses and find reasons that they will not continue to follow through on their plans. However, it is possible to learn to overcome these problems and defeat them. But in order to do this we must first admit to ourselves that we have lost motivation. The next stage is to analyse what caused this lack of motivation and understand that it is just a mind-set, and something that we can master. There are several ways to motivate yourself. Authors of the book Switch: How to Change Things When Change Is Hard, Chip and Dan Heath, claim that motivation is heavily influenced by emotions. The Heath brothers are convinced that emotions are an essential part of our plans and cannot be ignored. We just won’t start making life changes without involving emotion or feelings of motivation. As soon as we think of our plan, we only get motivated by adjusting our minds and feelings. 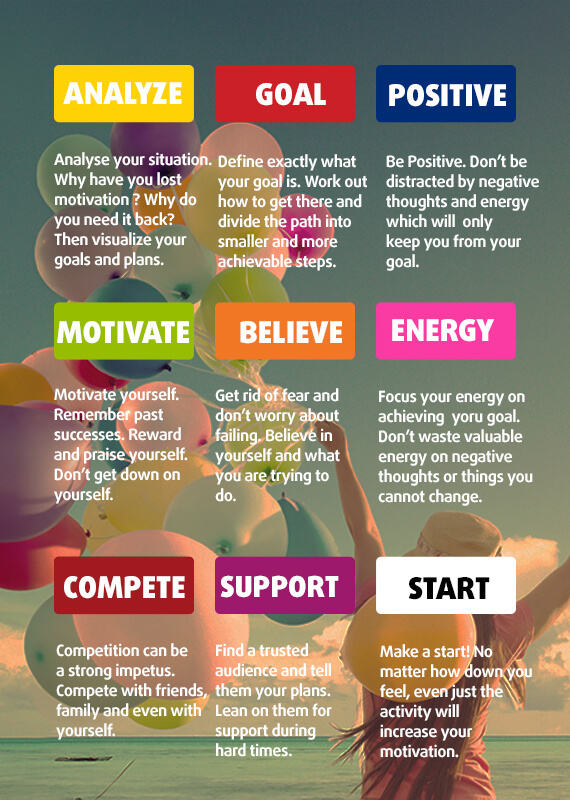 Based on more than 15 sources dealing with self-empowerment, motivation, success, and business, (as well as referring to various studies of psychologists and sociologists or successful publications of motivating authors), we have created a list of 9 tips to help you regain lost motivation. The most important thing to remember is that it is always within your power to make changes, nobody else can do that for you. First, analyse why you have lost your motivation or why motivation is missing from your life. Then define what you feel is missing from your life and focus on what you want to achieve and what will make your life better. Remez Sasson advises that each of us needs to really think about what we expect from life. Don’t forget about those small pleasurable things which always make life better! After the initial analysis of where your life is at right now, take time to spend a few minutes a day on visualization; imagine yourself doing exactly what you want to do in life. Without any barriers and limitations, visualise the most daring dreams that you have, casting aside lack of self-confidence, energy or enthusiasm. Imagine yourself as a productive and motivated person in your imagination. 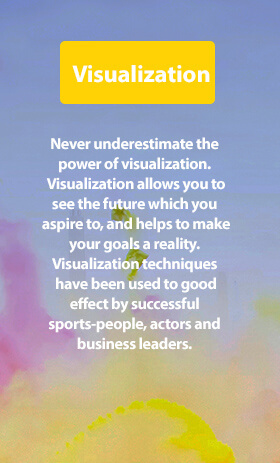 Visualization will help you to create pleasant feelings and create a knock-on effect to allow you to take further steps. In order to achieve your goals, you must be very clear about exactly what they are. ‘A promotion’ is too vague; what is the exact role you want to get within your company? Once you’ve defined your goal, you need to break it down into smaller goals and actions, steps on the way to your destination. Do you know why most of us can’t keep New Year’s Resolutions? It’s because the resolutions are too general. For example, if your plan is to lose weight, define exactly how much you want to lose and by when. Draw up a plan of the exercise you will need to do to achieve your goal, and the foods you will (and won’t!) eat. This means that each larger goal is divided into several smaller goals that suddenly become much more achievable. Once you meet the small goals, you will feel a sense of accomplishment. According to Remez Sasson of Success Consciousness, with consistent fulfilment of small tasks, you will build an inner strength that will make you more confident and motivated to embark on larger tasks. However, setting a large number of plans can cause you not to reach the end either, as it’s easy to become overwhelmed. Make plans and goals that you know you will be able to handle. In addition to the specific ideas of what you want to achieve, you need to change your way of thinking. According to Forbes magazine, negative thinking can persuade the individual that the goal he has set cannot be achieved under any circumstances. Conversely, a positive mind-set helps you manage the same goal much more easily. A study of American scholars at universities in Pennsylvania, Michigan and West Point showed that negative emotions or depressed people perceived an image of a hill as much steeper than the respondents in a positive and happy mood. Based on this research, they came to the conclusion that negative and positive mentality changes the way we perceive the goals that are ahead of us. Think about your past achievements. Give yourself a pat on the back for everything you've achieved in your life. It doesn’t matter if it’s the smallest of things, like pulling off a dinner party for friends or a creative sketch you drew while sitting on the train. 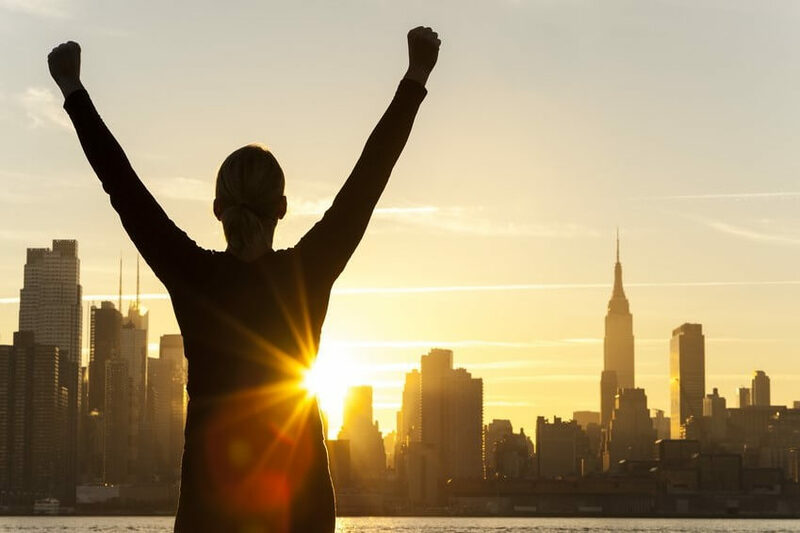 According to the psychological study carried out by Boston’s Northeastern University, motivation and endurance are associated with feelings of pride and satisfaction. People who have a healthy level of self-confidence and pride are much more persistent in achieving their plans and goals. Motivate yourself with your passion. It is only passion that can help you regain your lost motivation. Repeat to yourself exactly why you are doing this, why you want to do it, and why it is important for you to achieve that goal. How much will your life change for the better? Do you want to have your dreams come true? Procrastination, laziness and lack of enthusiasm or passivity cause misfortune, weakness, and dissatisfaction. Enthusiasm, motivation and a positive attitude towards life bring on feelings of joy, strength and success. Never give up. Are you afraid that you're failing? So what! Millions of people, including successful entrepreneurs or artists, have failed at one time or another. Steve Jobs dropped out of college because it was too expensive. At a loose end, he signed up for a calligraphy course, even though he thought that it probably wasn’t going to be of any practical help to him. However, that knowledge of calligraphy helped in the 10 years he spent designing the original Mac. Original typography was one of the major factors that made the Mac different from the competition and attracted so many people. Take an example from other successful and famous people who have gone through periods of experiencing rejection, failure and losing motivation, but never ceased to follow their dreams in life. Never give up! It doesn’t matter whether you're doing yoga classes, running in the park, working on your blog or any other creative project, or even looking for a new job. You must absolutely minimize everything that can steal your attention away from the task at hand. Keep all your energy in the service of fulfilling your tasks and goals. As you’ve probably guessed, the biggest thieves of your attention and time are the social networks, the phone, and the troves of other online content that beguiles us every day. If you really need to concentrate, turn off the phone, log out of Facebook, and ask your friends or relatives not to disturb you. When any external influence attracts your attention, it can be very difficult to get back to where you left off. That can mean the end of any motivation to keep working and you decide to leave it "for tomorrow". And we all know the saying that ‘tomorrow never comes’! Many people are able to radically increase their levels of motivation once some competitive feeling is thrown into the mix. Do you plan to lose weight in time for beach season? Contact a friend or girlfriend who has the same plan in mind, and who is also looking for some motivation. You can put together a plan, encourage each other and even compete a bit. 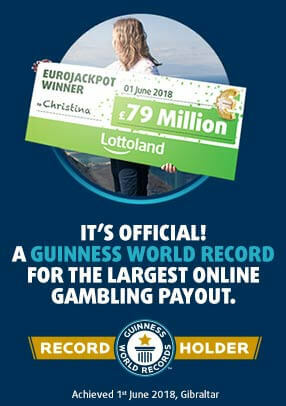 You can also do the same when it comes to playing sports or learning foreign languages. Follow the example of friends as they take on new challenges. As motivational speaker Jessica B. Casey asserts, the person in question does not even have to know that you are competing with them! In the absence of anybody else, you can compete with yourself by trying to beat your own records. Question: What’s the main motivating factor of actors in the theatre? Answer: The Audience! Tell your relatives about your plans, tell your friends and your work colleagues. By telling them about your plans, you will create a sense of responsibility towards these people. They will regularly ask you how you are getting along and what progress you have made. Surround yourself with positive people who will support you along the way as you follow your dream. Conversely, do not respond to or pay attention to negative comments. Research shows that what you think and how you perceive things has a big effect on how successful you are, so remember to stay positive! Even though you have shared your plans, remember the fact that everything is in your hands and only you have control over your life. Even if you feel that you are running low on energy, even if you feel miserable and demotivated: Start. It may hurt a little at first, and you may do it with reluctance, but the activity itself can trigger motivational processes. People are often discouraged because they go through all the ways a situation or task can fail in their heads. Of course, it’s human nature to think the worst! Psychologists Timothy Wilson and Daniel Gilbert have named this process ‘Affective Forecasting’, referring to people’s predictions about what their emotional state will be in the future.. However, according to studies, people are very bad at predicting their future feelings. Many of us cannot guess what will really make us happy or unhappy in advance. According to Psychology Today, these types of predictions only blind us and we should not put any weight in them. An example may be the first day of a new job. Each of us is excited in some ways, but at the same time feels a level of stress about the unknown. Moreover, if it is a different type of work to what we have been doing so far, we can become overwhelmed by the thoughts of failure: What if I can’t do it and they kick me out within the first week? Do I really have enough experience for this position? We wish you all the luck in the world with finding your lost motivation. Believe in your dreams, think positive and plan for the future. A small dose of inspiration to help you eliminate the fear of failure and improve your mood can be found in our article about the 20 Best Motivational Movies, so check it out for some great recommendations.